Listen to a wide variety of musical genres. Practice their instruments/voice at home. Encourage your child to learn a musical instrument. YouTube can be a great resource for this. Take your child to see a live performance. Visit websites such as BBC Bitesize and the school VLE. Visit the Office365 Music SharePoints. Peripatetic Instrumental Lessons – students are offered the opportunity to learn an instrument or take vocal lessons. Coursework Clinic – students from GCSE groups are able to get extra help and challenge themselves to be the best they can. Unity Choir – all students welcome to learn to sing in harmony and enjoy being part of a larger ensemble. Carol Service – our most talented performers and ensembles are invited to perform at our annual carol service. Performance Trips – trips to see live performances are open to all students. Some of these trips are just for students who take GCSE Music. Balcony Performances – students are able to see the audition process for musicians by auditioning and performing at our half termly balcony performances. Musical Productions – students are able to contribute to the cross faculty productions to enrich and support student’s interest in the arts. 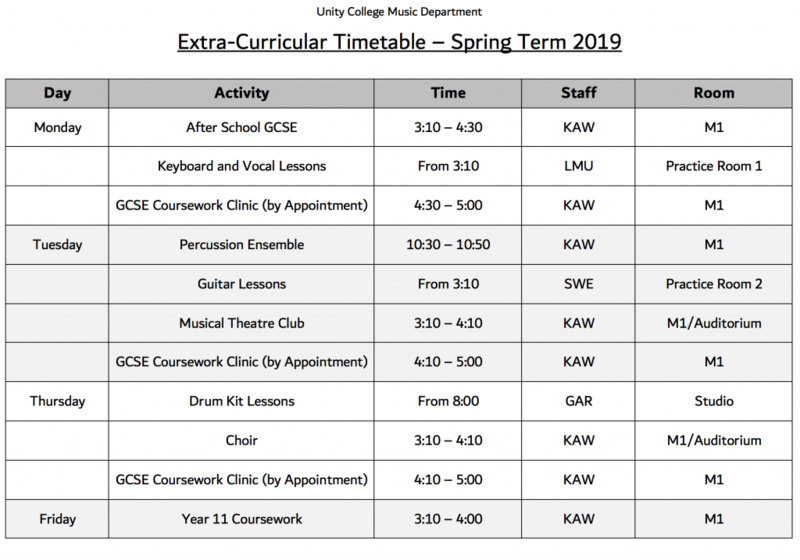 Percussion Ensemble – our most talented performers are invited to develop their skills by performing with a percussion ensemble. Concert Tours – trips both within the UK and abroad to develop their cultural understanding of music.